Several years ago, I had the chance to work with a non-profit organization on the West Coast of the United States… let’s call it “Organization X.” It was a great charity, and did good work in the world. But, like most non-profits, it struggled with fundraising. I reviewed the strategic and development plans for the organization. I interviewed staff, volunteers, board members and donors. I sat in on fundraising asks, reviewed online and offline fundraising letters, and dug into the donor database. At the end of the process, I sat down with the organization’s board of directors to deliver the bad news. “The problem with your organization isn’t your mission, or your development plan, or even your people. It’s your culture. What you have here is a penny-pinching, nit-picking, small-thinking non-profit.” After the words came out of my mouth, I was worried that they would kick me out of the board room. But they didn’t. Instead, they heard me out. I explained to the board that the culture at the organization was so risk-averse and boxed-in that the charity would never be able to become a prevailing non-profit. Instead, the organization had condemned itself to an existence of constant financial turmoil and forever living check to check and event to event. First, the non-profit had a culture of penny-pinching. Instead of looking for ways to dramatically increase revenue, the organization was constantly looking for ways to cut costs. If someone came up with a new fundraising idea, they were made to do everything possible to do it for free or very, very cheaply. When decisions about direct mail packages, donor communications or events came up, the staff invariably chose whatever option was cheapest. Because of this, instead of making the choices that had the highest return on investment (ROI) or netted the most revenue, the non-profit chose the low cost option. Second, the staff was constantly nit-picking everything. Colors for this year’s gala invitations? Four week decision process. Staff member wants to change the wording on the organization’s thank you notes? Send it through a board committee and then require a vote of the entire board at its next quarterly meeting. Development Director decides to have her staff call through lapsed donors earlier this year than last? Ask the Executive Director, who recommends that they solicit feedback at the next staff meeting, and also that they check with the head of the board’s development committee. Everything was a hassle. Everything took way too much time. As a result, nothing new ever got done. They did the same old tried and true tactics every year, because changing them took too much time and energy. Third, the non-profit constantly thought small. Every year’s development plan called for miniscule growth in various forms of revenue. This year’s annual campaign? Let’s raise an additional 1.5%. Online fundraising? How about .02% growth each month? (Seriously). Does this sound like your non-profit? Can you see any of these traits in your non-profit? 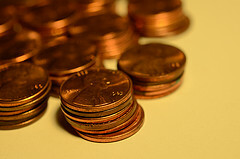 Have you been penny-pinching, instead of looking at ROI? Do you nit-pick ideas and tactics until they are dead in the water, or waste energy debating and deciding things that don’t really matter? Are you guilty of thinking small about your mission, programs, or fundraising? Each of these three things usually starts small, but grows like a cancer inside of your organization. No non-profit starts out saying they want to focus on the small stuff, instead of the big vision, or makes plans to forgo larger donations that require harder personal asks and instead go after small donations by holding dozens of time-consuming small events. No non-profit plans for it, but many are stuck here. The first step to getting back on track is to realize when you are working for a penny-pinching (and/or) nit-picking (and/or) small-thinking non-profit. When you do realize it, gather your senior staff, resolve to change course, and develop a detailed plan for doing so. Organization X, the non-profit I told you about at the beginning of this article, did just that. The board, to its credit, saw the culture problem I described, and resolved to change it for the good of the organization. Together, we developed a plan to test new and bold ideas, streamline the decision-making and approvals processes, and instill a culture of thinking big. And it’s working. They’re raising more money than ever with less effort. They are well on their way to becoming a prevailing non-profit. I loved this piece. It’s one of the reasons I got out of the nonprofit sector. I felt like I could provide solutions from the outside and it be received so much better. I admire you for having the hutzpah to speak to the board when your job was most certainly on the line. This article was very insightful and I will most certainly share this with the nonprofits that I work with, especially those continually struggling with why they aren’t growing financially. Thanks Nikki, glad you liked it! I hear you loud and clear, Joe! While my own work is targeted to “small shop fundraisers,” the goal is not to stay small, but rather to think in terms of developing the solid donor-centric strategies that lead to long-term funding – and avoiding shiny object syndrome. There are so many issues here. Fear of success. Control. Would love to hear more about this nonprofit. What steps have you implemented? How have you cut down on the approval process? Thanks Pam… I agree that the issues you mention are problematic for many organizations. What made this change work for this client was real open-mindedness on the part of the board and senior staff, and a willingness to bring in an expert (me) and trust my experience and counsel. Many non-profits would have shown me the door when I announced that wholesale cultural issues were holding them back. There was some dissension here, along with some heated meetings, but ultimately the board and ED put the good of the organization ahead of personal pride. For approvals, we put a 1-2-3 step approval process in place. Most small decisions require only one approval – that of the division manager (Finance Director, Programs Director, Admin Director). Over a certain cost threshold, and certain other items (such as press relations), 2 approvals are required (the division manager and the ED). The only items that require three approvals (the division manager, ED and the board) are those items that substantially deviate from the board’s approved budget, program goals or development plan.